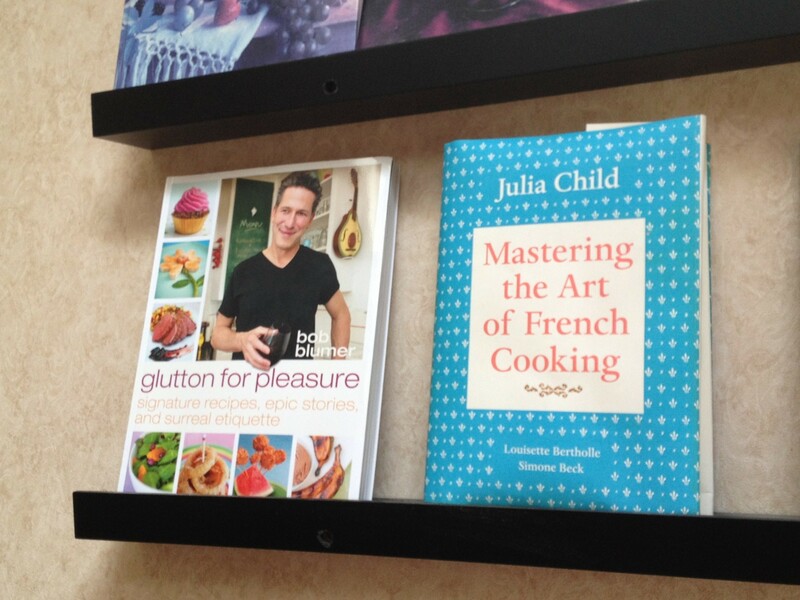 Recently I shared with you my cookbook shelf, as well as mentioning a very special and important cookbook to me, The Surreal Gourmet by Bob Blumer. It was the cookbook which gave me my wings and the confidence to fly, and fly away I did. In fact, I flew so far and didn’t look back, so I had no idea what Mr. Bob Blumer has been up to all of these years. Turns out he had a pretty impressive and colorful career, including three subsequent cookbooks, two Food Network television shows, and numerous Guinness World Records. Needless to say, I was completely starstruck when Bob emailed me a thank you for the shout-out and mentioned he has a new and possibly cookbook-shelf-worthy book out, Glutton for Pleasure. I immediately ordered it on Amazon, so keep in mind my review is based on a book purchased with my own Ed’s hard earned dollars. In the interest of full disclosure, Bob was gracious enough to send me an autographed copy for The Shelf. How could he possibly resist his biggest fan? I love this book! Part memoir, part guide, part recipes, and wholly entertaining. If I knew any young brides or young bachelors, I would give it as a shower gift or housewarming gift. There is so much great advice in here on the practical aspects of setting up a kitchen, choosing the right wine and entertaining in any sized space, in addition to humorous stories, classic recipes (my beloved Caesar salad, steak au poivre, and beer can chicken), new-to-me recipes (maple-icious salmon, mambo chicken, love me tenderloin), kid-friendly recipes (popcorn cauliflower, parking lot eggs) and just plain weird, uh, I mean surreal and clever recipes (lamb cupcakes with beet frosting, dishwasher salmon, cereal killer soup). Some of my fondest memories are of our salad days, when we were newly married and living in our first townhouse. We would put on 10,000 Maniacs Our Time in Eden CD, prepare Bob’s Caesar salad in our small kitchen (beer and homemade croutons always mandatory) and talk about our life and our dreams. We had so much less back then, but we were very happy, and no salad ever tasted so good. Twenty-plus years later, Bob is still inspiring me. This entry was posted in Life, Reviews and tagged bob blumer, cookbook, Glutton for Pleasure, salad days by Mom Mom's Apron. Bookmark the permalink.